Do you recall a time you opened a brand new box of crayons? Sharpened points all in a row, a box gives you a choice of 12, 24, 64, or 120 brand new colors and endless possibilities. As a child, if I I was already in the middle of a project, I would pick up the color I needed to continue, grateful for the familiarity. 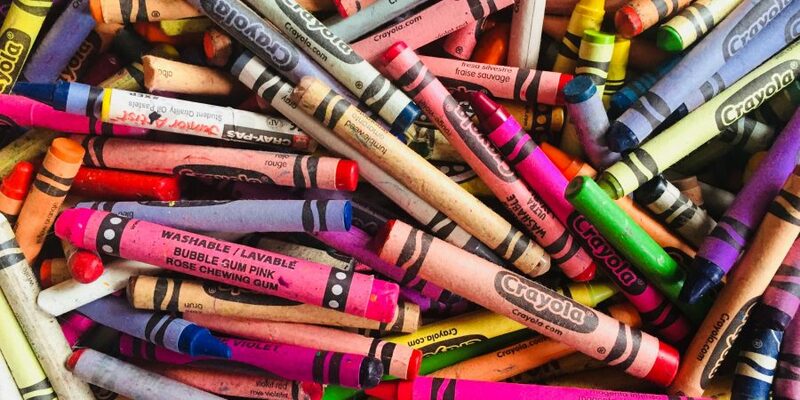 If a box was given to me out of the blue, I would take a look at the names of the crayons and consider which ones to save for special projects, the “special china reserved for important times” of the bunch. If a box came with a built in sharpener? Glory be. I tend toward all shades of blue. As a result, I remember blue stubs of crayons in my childhood when the pinks and the greens still had a lot of color to give. Despite my best plans, the holidays season did not include time for rest and reflection for me this year. Between traditions and several family birthdays, I would likely not have noticed the gift of a new box of crayons. The first two weeks of January, I always protect time to spend alone, either in silence or with music, to consider the year ahead. I don’t subscribe to goal setting in the usual sense and I definitely don’t always agree with the world’s push for individual change and progress. Instead, I return to silence and a walk in the woods to be able to listen for intention and to consider what to let go of and what to continue to grow, I talk to the people I love, I lean in to listen. Growing up, I used to think of a new month or a new year as being a blank canvas. I am no artist when it comes to paint and brush, but the metaphor always worked for me. A fresh beginning. Out with the old, in with the new. Over time, the pressure I’d put on myself for that blank canvas became a burden. As I’ve gotten older, especially at this time of year, I like to reflect on the metaphorical tools I have, instead of the canvas itself. Have I used some crayons to much? If so, why? Did someone keep taking my yellow? Why didn’t I notice? What have I learned? What does it feel like to create alone? What does it feel like to create with others? What colors did I neglect? What is still stirring inside of me? My thoughts journey way past crayons, but thinking of what I have as an artist’s toolbox really does help me, holding the gifts I bring up to the world’s needs and the considering what might be next and how to get there. I’ll tell you this, while we’re using metaphors: I like using the same colors and enjoy the familiarity and security of a specific paintbrush. However, in the last few years, I have drawn with that crayon that I was only reserving for special occasions much more often. I can tell you that this past year my green crayon was stepped on over and over again and, well, lesson learned. Overall, I’m trusting more colors and different brushes, encouraging myself to try something new when that seems right or to return to the familiar blue when that brings comfort. I enjoy learning what colors others choose and what fills their toolbox. Focusing on the tools instead of the canvas reminds me of the gift of it all…what is possible and what I have to offer and helps me to imagine a world of abundance instead of scarcity, where we share and listen easily and often. My paternal grandmother was an incredible painter. During most visits to her house, her dining room table was covered in paint and china in various stages of being painted. Her favorite thing to paint was birds. As an adult, I often long to be able to sit at that table with her to watch her paint. She painted in much the way she lived, with intention and care. Her birds were typically blue or red, but I remember one time she showed me a yellow bird she had painted on a plate. It brought her such joy, I imagine because of the surprise that she created it. To watch something come to be from her mix of paints was something I will never forget. She had the same gift with spaghetti and butter with jelly toast, all of which there was always enough of for anyone who needed something to eat. She spread jelly on a piece of toast just as intentionally as she painted a bird on china, something I learned from and will never forget. What tools and gifts do you hope to use this year? Do you tend toward the familiar, or are you ready for something new? I am embracing a new box of crayons and the promise that comes with it, if only I remember what I already have. My familiar blue crayon might be mixed with glitter this year. Because, why not? It’s time. I hope you show up with all that you are this year, surrounding yourself with people who support you who also let you support them. I say it’s time for a collective masterpiece. I savor these posts for the poetic writing and thoughtful guidance held within, and am grateful for the humble soul that pens each one. Such a joy to read!